The perfect introduction to Parker’s CLOUD-based monitoring solution. 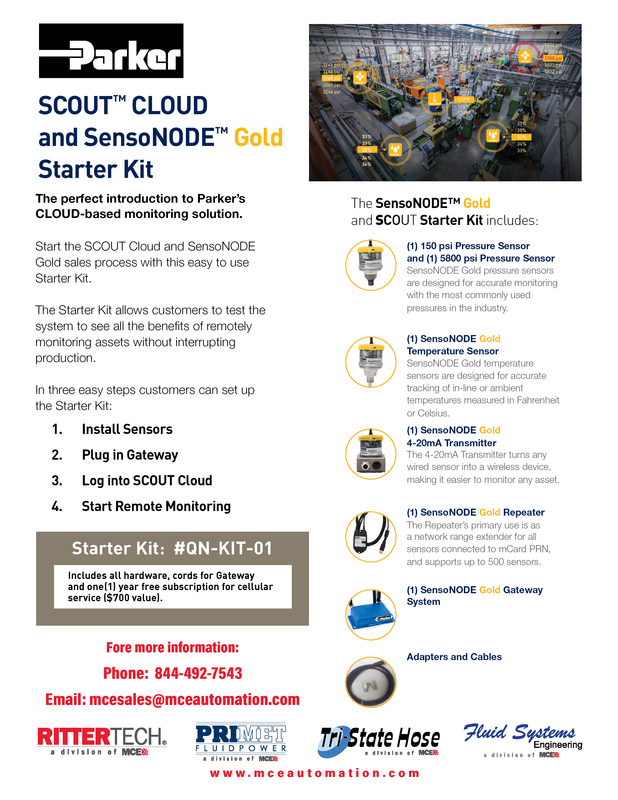 This easy to use Starter Kit allows you to test the benefits of using the SCOUT Cloud and SensoNODE remote monitoring solution without interrupting production. RitterTech-PA announced today that has moved its State College ParkerStore™ location to 1245 Benner Pike, Suite 100. The store was formerly located at 2929 Stewart Drive. RitterTech-PA is a division of Motion & Control Enterprises (MCE), a leading industrial distributor of Parker Hannifin motion and control products and systems. The State College ParkerStore Benner Pike location is open Monday through Friday 7:30 a.m. to 4:30 p.m. A Grand Opening Celebration for the new location is scheduled for Friday, August 3, 2018 from 11 a.m. to 2 p.m. The celebration will include door prizes, raffles, and a free barbecue lunch. 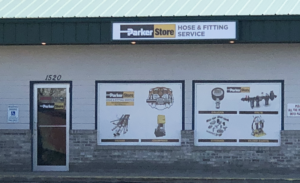 The State College ParkerStore™ offers custom hose assemblies, couplings and fittings for hydraulic, pneumatic, industrial, and mobile applications along with 24-hour emergency service. RitterTech-PA operates a network of ParkerStores™ across Pennsylvania in Erie, State College, West Mifflin, and Zelienople. MCE has on-hand inventory of more than $12 million to support all its divisions backed by $150 million of available inventory through its association with the DistraNet Inventory Sharing Group. 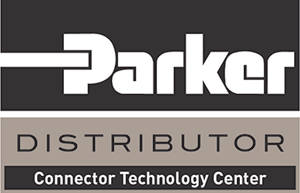 Motion & Control Enterprises LLC (MCE) is proud to announce it was recently awarded the prestigious designation as a Connector Technology Center (CTC) by Parker Hannifin Corporation. The CTC designation is an elite honor reserved for the top tier Fluid Connector distributors who achieve specific proficiencies and capabilities as defined by Parker. MCE achieved the CTC designation following an exhaustive Management and Performance (MAP) evaluation of all nationwide Parker Fluid Connector distributors. The MAP evaluation extensively reviews distributor performance in 38 categories that Parker considers critical for the CTC. Among other things, MAP considers financial condition, management strength, planning capabilities, sales and marketing expertise, and historical performance. In addition to the CTC designation, Parker also recently awarded MCE’s RitterTech-PA division with a Diamond Team Sales Award. To achieve this coveted distinction, the division must achieve 100% of established sales dollar quotas, meet specified yearly business objectives, and participate in Parker training sessions, among other things. 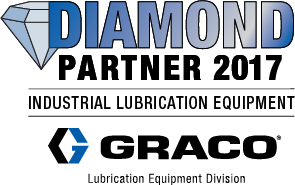 MCE is a multi-state industrial distributor of Parker Hannifin motion and control systems, Graco industrial lubrication equipment, Enerpac high-pressure power tools, and other top manufacturers of fluid power and industrial lubrication products. As such, MCE provides automation, motion and control, fluid handling, and lubrication expertise to the Great Lakes industrial region through the combined efforts of its operating divisions that include RitterTech, Primet Fluid Power, Tri-State Hose & Fitting and Fluid Systems Engineering. Headquartered in Western Pennsylvania, MCE has multiple regional fulfillment centers and ParkerStore™ locations throughout Wisconsin, Illinois, Indiana, Michigan and Pennsylvania. Condition monitoring like never before: Continuous. Non-interuptive. Safe. enables more informed and confident decision-making and greater peace of mind. To assist in compliance the recent OSHA Respirable Crystalline Silica (RCS) Standard, Parker’s Series 7084 Twinhammer™ Bonded Air/Water Jackhammer Hose is the first factory-assembled dual-hose system to deliver both air and water in a single unitized configuration for silica dust suppression in pneumatic jackhammer hose applications. [Zelienople, PA] – Ritter Technology, LLC, a leading distributor of industrial motion and control products, announced that it changed its name to Motion & Control Enterprises LLC (MCE). The change reflects the expanded market focus that resulted from MCE’s 2017 acquisition program. In 2017, MCE bought the business of Primet Fluid Power (February 2017); Tri-State Hose & Fitting, (April 2017); and Fluid Systems Engineering, (May 2017). The core business of Ritter Technology, LLC, has also been renamed RitterTech in the various states where it operates to maintain the brand equity of the Ritter name in its existing markets. All of these existing and acquired businesses will operate as divisions under the MCE name. MCE intends to operate as a platform company going forward as it intends to acquire other companies in the future. In coordination with the name change, MCE launched a new company website available at www.mceautomation.com, and has registered brand logos for MCE and RitterTech. RitterTech, founded in 1951, is a multi-state, industrial distributor of Parker Hannifin motion & control systems, Graco industrial lubrication equipment, and Enerpac high-pressure power tools, along with an extensive line of other top-tier fluid power and industrial lubrication products. RitterTech focuses on fluid power and lubrication customers located in the Great Lakes Basin (WI, IL, IN, OH, PA, WV and NY). Primet Fluid Power, founded in 1983, sells and services hydraulic and electrical control systems principally to steel manufacturers located in the Illinois/Indiana corridor. Tri-State Hose & Fitting, founded in 1982, sells fluid connector products to end users and manufacturers located in the northeast Illinois/ northwest Indiana corridor with a focus on mobile services. Fluid Systems Engineering, founded in 1961, is a hydraulic and pneumatic fabrication and distribution company with extraordinarily deep engineering expertise serving principally the MI automotive and industrial marketplaces. Fluid Systems Engineering also maintains a Parker Store in Clinton Township to serve the Northwest side of Detroit. Zelienople, PA, May 3, 2017– Ritter Technology, LLC (Ritter), a leading provider and distributor of industrial motion and control products, announced that it has acquired the business of Fluid Systems Engineering located in Clinton Township, MI. This most recent acquisition strengthens Ritter’s commitment to providing engineered hydraulic and pneumatic products to its customer base in the greater Detroit area. “We are pleased to welcome Mark Steiner and his team to our expanding network of motion and control companies. Given Ritter’s focus on providing products and services to our industrial customers in the Great Lakes Basin, Fluid Systems Engineering bolsters our presence in the Engineered hydraulics and pneumatics segment of our Michigan market. We see a great deal of synergy between our existing Michigan operations in Detroit, Saginaw, Warren, and Wixom, and look forward to enhancing our product offerings to customers in this important market.” stated Tim Hall, Chief Executive Officer of Ritter Technology, LLC. “We have talked to Ritter over the years and understand what a combined force could achieve in the Detroit market. We bring well-recognized hydraulic and system engineering and fabrication expertise to the table to help further penetrate Ritter’s customer base with value-added and cost-efficient solutions.” Said Mark Steiner, President of this newly acquired division. Ritter is a multi-state, industrial distributor of Parker Hannifin motion and control systems, Graco industrial lubrication equipment, and Enerpac high-pressure power tools, along with an extensive line of other top-tier fluid power and industrial lubrication products. Ritter focuses on fluid power and lubrication customers located in the Great Lakes Basin (WI, IL, IN, MI, OH, PA, WV and NY). Fluids Systems Engineering is a hydraulic and pneumatic fabrication and distribution company with extraordinarily deep engineering expertise serving principally the MI marketplace. Fluid Systems Engineering also maintains a Parker Store in Clinton Township to serve the Northwest side of Detroit. Zelienople, PA, April 1, 2017– Ritter Technology, LLC (Ritter), a leading distributor of industrial motion and control products, announced that it has acquired Tri-State Hose & Fitting (Tri-State) located in Munster, Indiana. This acquisition strengthens Ritter’s commitment to provide fluid power hose and connector products to its customer base in the greater Indiana/Illinois region with a special focus on Northwest Indiana. Tri-State was founded in 1982 and was owned and operated by James Smith. “We are pleased to welcome Jim Smith and the highly talented Tri-State team to our expanding network of motion and control companies. Given Ritter’s focus on providing products and services to our industrial customers in the Great Lakes Basin, Tri-State fills in our recently established Indiana footprint for hose and connector fittings. We see a great deal of synergy between our businesses and I look forward to working with Jim in the coming years.” stated Tim Hall, Chief Executive Officer of Ritter Technology, LLC. Jim Smith noted: “I have competed with, and worked closely with Ritter professionals in the past. I respect and trust the character of their organization and their commitment to customer service. Ritter has been great to deal with and we look forward to becoming part of the growing Ritter family”. Ritter is a multi-state, industrial distributor of Parker Hannifin motion & control systems, Graco industrial lubrication equipment, and Enerpac high-pressure power tools, along with an extensive line of other top-tier fluid power and industrial lubrication products. Ritter focuses on fluid power and lubrication customers located in the Great Lakes Basin (WI, IL, IN, OH, PA, WV and NY). Tri-State Hose & Fitting sells fluid connector products to end users and manufacturers located in the northeast Illinois/ northwest Indiana corridor.